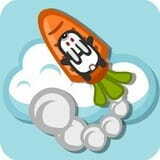 Help a rabbit with game Bunny Goes Boom to reach the maximum height. Set up personal records and have got to with achievements with friends. Having earned there are enough bonuses, it is possible to get improvements and to reach still the big heights!